I will say it again, I love that I’ve been gifted with venison from a generous co-worker. Without it, I wouldn’t be enjoying some of the cooking adventures that I have had. Two weekends ago I found a winner with this post. I may not have another piece of venison backstrap, but I’ll definitely try it out with a piece of beef. I decided to open up the package labeled: “Eye of Round” and found that it was all cut into medallions. It wasn’t what I expected to find, but I was able to work with it. I will point out that I’m in love with honest-food’s website. 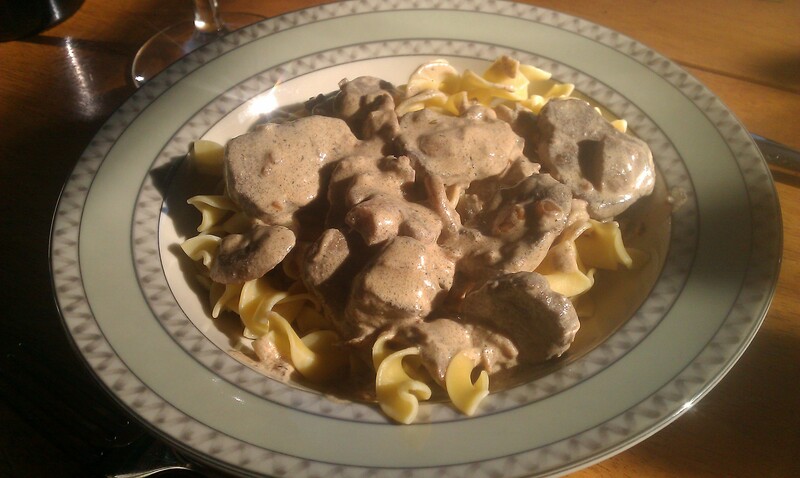 I found the most amazing stroganoff recipe and made a few, minor, changes. I had four ingredients on my list of things to buy. You’d think I could have remembered only four ingredients but nope, I forgot the shallots. I ended up using onions in place. I had to use dried dill, ground nutmeg and Old Vine Zinfandel but it was just as amazing as I had envisioned. I’ll definitely be making this again. Do the right thing, people.